Wizorb has been slightly misrepresented in trailers, but that doesn’t stop it from being pretty cool. The impression most people have of the game is that it’s a cross between Breakout and RPGs, with sweet pixel art. In reality, it’s Breakout with some very light RPG elements, and super-sweet pixel art. The game is very much focussed on the Breakout aspect. 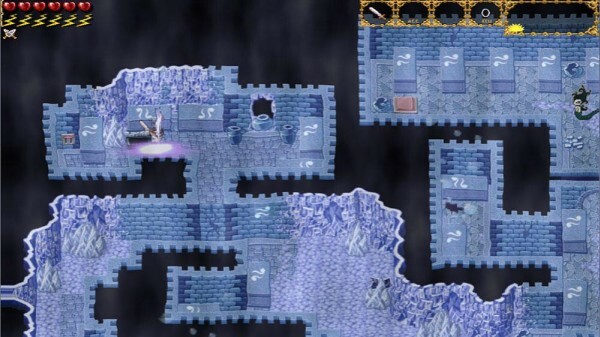 In each of the five worlds, you’ll face 12 levels and then a boss level at the end. Levels are colourful and brilliantly designed, but the game is still standard Breakout stuff, mostly. You’ll move your paddle left and right and deflect a ball to break all the blocks in the level and then progress to the next and you’ve got three lives in which to reach the end. 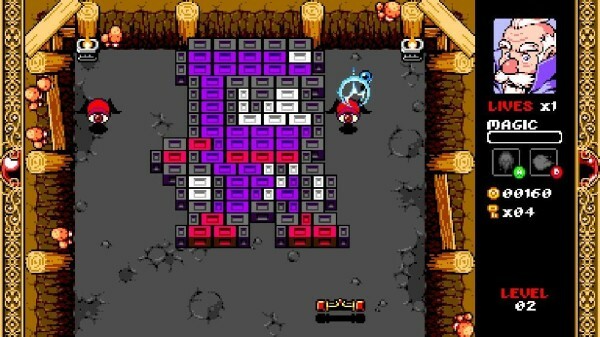 You can continue three times and extra lives are available throughout the levels, but it’s not always easy to get to the world’s boss and it’s almost recommended that the game is played on “easy” which gives you a couple of extra lives per continue, it really makes a difference later on. The bosses are excellent. While sometimes they’re as simple as hitting them with the ball, sometimes they require a little more strategy than that, and that’s where the magic comes in. You have a few magic spells at your disposal such as a fireball that fires from your paddle and destroys a block, a fairy that lets you manoeuvre the ball directly, and a few others. They’re always ready as long as you’ve got the MP to cast them, with your MP replenished by collecting potions which fall from certain destroyed blocks. There’s more to think about than there would be in a basic Breakout clone, then, and between balancing magic and thinking about angles and lives and gold there’s a lot to contend with. It plays really well, and in hours of play there wasn’t a single instance where I thought a death wasn’t my fault. That’s a positive that can’t really be stressed enough. In so many Breakout clones (and there are so many on XBLIGs, even) the paddle is difficult to control. It’s too fast, or it doesn’t stop quickly enough, or the momentum is all wrong. Wizorb gets the movement completely spot on, absolutely perfect. When you want it to move somewhere, you’ll be able to put it exactly where you want it at exactly the speed you want to put it there. The Breakout side of the game is excellent, but the RPG side of it is lacking. It’s not bad, or anything, it’s just very light. There’s a basic plot about a village that’s been destroyed which you can pay to restore using gold coins you collect in levels, but there’s not really any focus on this at all if you want to ignore it completely, you could do, because it doesn’t have much impact on whether or not you’ll complete the final world, the rewards you get from the RPG side of the game are just things that you can get from destroyed blocks in the levels anyway. It’s not really an issue, though. The RPG side of the game may be light but it’s the Breakout side of it that you should be here for because it’s a really tremendous rendition of it. Combined with magic, bosses, and some secret hidden paths in levels that unlock a super-attack, there’s loads of variation in the gameplay and it’s something I happily sat and played to completion, enjoying every minute. Wizorb is available now for 240 Microsoft Points. High Gravity Wells (get it?) is a game that basically nobody will buy, which means that it’s a game that basically nobody will realise the aceness of. You should download it, then you can make all your friends download it and tell them how you liked it before it was cool. You should also download it because of the aforementioned aceness. It’s a puzzle game. It’s an action game. Aczzle. Puction. I dunno. It’s both. Deal with it. You have to direct your little ship to a space station, but you don’t have anything in the way of thrusters. It’s like the anti-Hypership Out of Control, you have nothing but brakes. What you do have, though, are gravity wells. Up to four are present on each level and you can operate them with the various face buttons at your disposal. When you activate one, your ship will be attracted towards it and if you keep it turned on, your ship will orbit it. You can then turn it off and your ship will be thrown off in whatever direction it currently has momentum in. Or, you could just turn the wells on in turn to manoeuvre the ship around between them without actually going anywhere near them. You’ll need to use various different methods to get your ship to where it needs to go, avoiding the many hazards that litter the way. Black holes that have a gravity field of their very own and will irreversibly pull you in. White holes that repel you at speed. Asteroids that, well, it’s pretty obvious what happens when you come into contact with an asteroid. The whole game is wrapped in the incredibly simple concept, then, and it’s impressive how much variety there is in the levels despite that. That’s where the puzzling comes in. Getting to where you need to go is all action, but working out a sequence of buttons that gets you there can often be difficult – which isn’t to say that then performing said sequence is easy. If you want replayability, how’s this: each set of eight levels scores you on how many times you die while completing it. The last set isn’t particularly easy to bring in under triple figures; reckon you can do it? High Gravity Wells has “ignored” written all over it. It’s just one of those games that, no matter how good it is, people just won’t try it. Especially with the amazing luck that sees the game released on the same day Microsoft put half it’s XBLA catalogue on sale. Don’t be part of the problem, you won’t regret giving it a go. High Gravity Wells is available now for 80 Microsoft Points.